I’ve been on a mission lately to get out and rediscover some of our more local sites. It always surprises me that Sherwood Forest is so close by to us because we hardly ever visit. However, armed with our new dog Annie, we decided it was a perfect dog friendly location to visit! Here’s our guide to visiting Sherwood Forest and seeing his legendary hideout the Major Oak tree. 1 What is Sherwood Forest famous for? What is Sherwood Forest famous for? 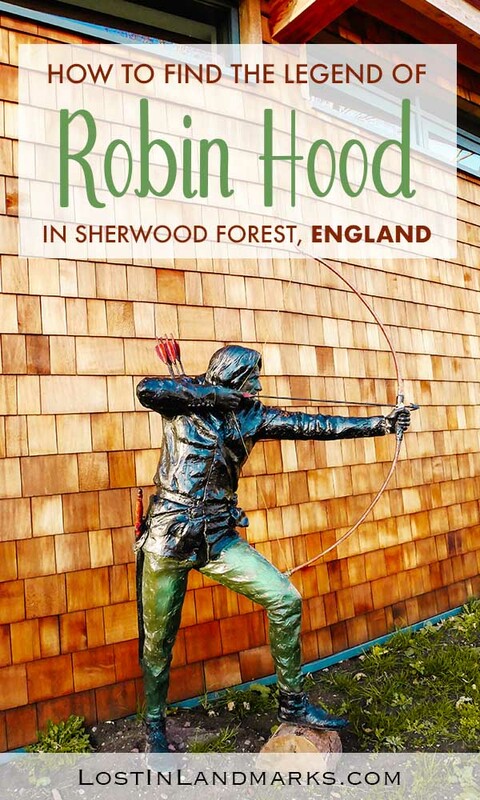 I think most people have heard of the Sherwood Forest history and it is, of course, famous for being the home of the outlaw Robin Hood in medieval England. I’m sure you’ve heard the tales of him stealing from the rich nobles and giving to the poor – if not where have you been? There’s even a Disney film about it! I was a teenager when the Kevin Costner version of the movie came out and I remember being so enchanted by the story – I really wanted to learn more! Sherwood forest was huge in the time of Robin Hood – probably around 100,000 acres and would have been home to many animals such as deer and even cattle. The wood definitely wouldn’t have been wild forest as many people might imagine, but managed in a way to provide income – wood being a valuable resource – and of course food. 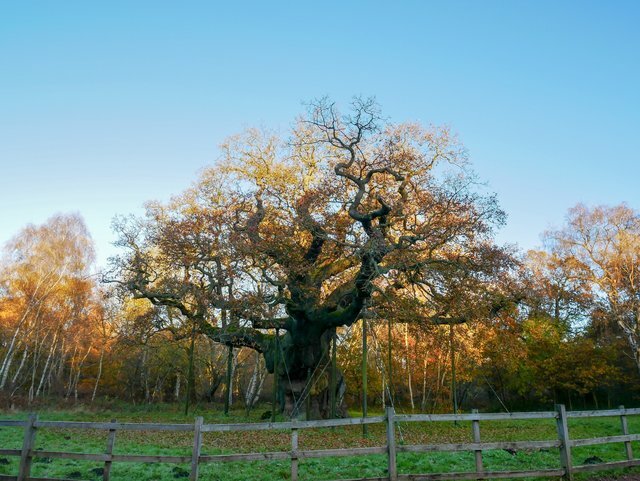 There are many old oak trees in Sherwood Forest, over 1000 of them, but one is a big attraction – the Major Oak. This is said to be Robin Hood’s tree, the one that he hid in. It’s easy to imagine that nowadays when looking at it – it’s really a huge tree, really wide with a majestic stance – but I’m not 100% convinced myself that it was the tree the legendary man himself hid in. It’s estimated to be at least 800 years old and some say perhaps 1,000 years old. If the latter is true then perhaps it could be true? I guess we’ll never know! The tree is fenced off so there’s no getting up close and personal and being able to touch the Major Oak – with the amount of visitors it gets each year this is probably sensible! It’s also sporting some rather lovely bracing to help keep the oak there for us to enjoy for many years to come – it’s such a huge tree I imagine that without it it would begin to become too heavy for itself. There has been a huge input of cash in to the Forest recently and you can definitely tell. We’d visited quite a few years ago now and it was definitely feeling a little more run down. The regeneration isn’t fully complete yet but it’s looking pretty good. There’s a new Sherwood Forest Visitor Centre which has a cafe, shop and toilets (the only toilets in the forest). We didn’t look inside ourselves as we had the dog with us – next time I’ll try and have a wander in! You can also find out more about the forest, about the legend of Robin Hood and find out about the walks in the area. You can also hire backpacks for the kids which include different activities to keep them happy on a visit – mine have unfortunately grown out of this! 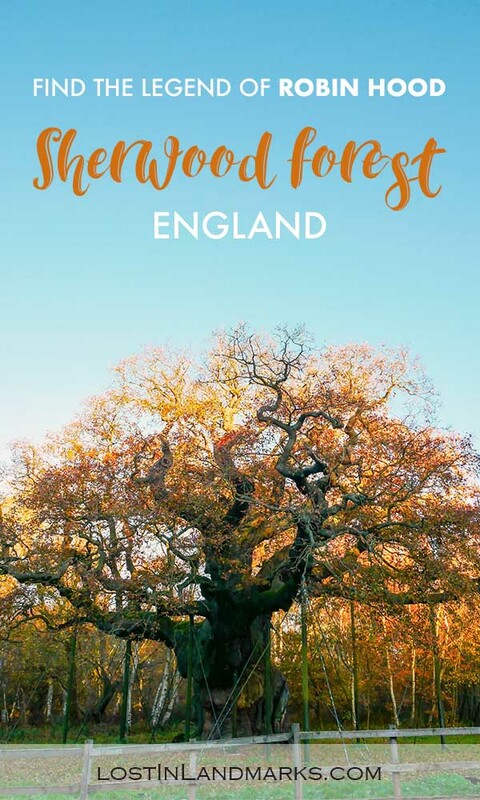 There are 3 main Sherwood Forest walks that you can pick up a leaflet to guide you round depending on how far you want to walk. If you don’t want to go too far then the basic walk to the Major Oak and back again will take you about 45 mins and is about 1.5 miles. The trail is easy and the paths are well marked – perfect for all ages and abilities. 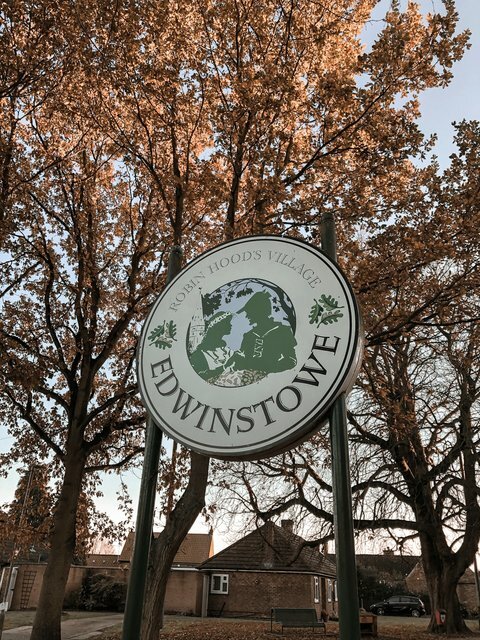 If you come to Sherwood Forest because of your interest in Robin Hood then you absolutely have to wander down in to Edwinstowe village while you’re here. Why? Because there’s the most beautiful church there that is said to be the place where Robin Hood and Maid Marian married. 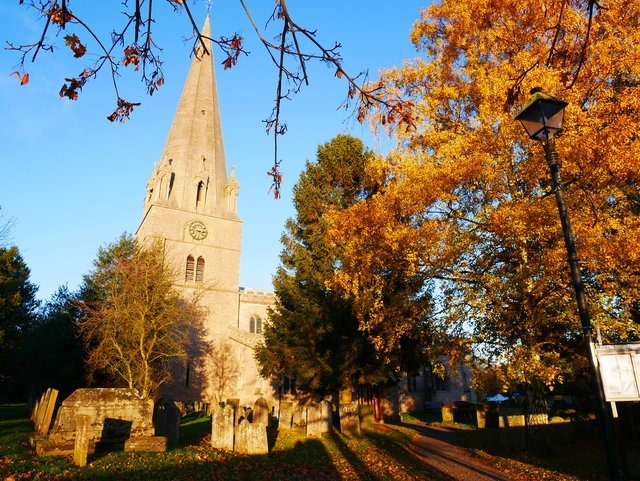 St Mary’s is contemporary with the legend of Robin Hood as it was built around 1175 so who knows? The legend may well have some truth in it. The church is still used today by local villagers but it is often open and welcomes tourists to look around. It wasn’t open when we visited though so we just got to enjoy the autumn colours on the trees in the graveyard. Very pretty and definitely somewhere to explore. The whole village is very pretty and worth exploring – there’s also some craft shops to look around too so don’t miss those. With the new partnerships withe the RSPB there’s an increase in nature events on at the forest so it’s worth seeing if there’s anything on that coincides with your visit. Their website will show you all the latest events. 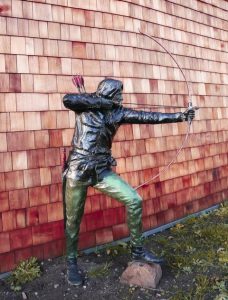 Every August Bank Holiday there’s a week long festival that’s free entry with all sorts of Robin Hood themed activities going on. I’ve not been myself but many of my friends have and return year on year for loads of medieval fun! Check out the event page here. Taking place in December, this event lights up the ancient trees in Sherwood Forest – it’s normally by ticket only so keep an eye on their website for when they are released as this is a really special event. The next one will be in 2019. The new visitor centre is open from 10am – 5pm from March to October and closes slightly earlier at 4.30pm from November through to February. The forest is accessible at all other times of course, but do be careful visiting if it’s close to dark falling – make sure you have a torch and know how to get yourself out! Sherwood Forest is located in North Nottinghamshire in England and is just over 20 miles (45 mins drive) from Nottingham or 30 miles (45-60 min drive) from Sheffield. Driving is the easiest way to get around the area – if you’re visiting England from overseas and want to rent a car to get around I recommend checking out RentalCars as they compare prices of the biggest brands. There is a new parking set up at the moment with the regeneration of the site. There’s room for plenty of visitors and it costs £4 for the day. When we visited it was manned and we payed on entry but there’s also some pay and display machines so that may not always be the case. Take cash. The car parks are open from 9am – 5pm and it can accommodate motorhomes, camper vans and coaches as well as cars. The postcode you need is NG21 9RN and follow the signs for parking once you get there as the parking is on the other side of the road to where the Sherwood Forest visitor centre is. If you want to come by public transport then I suggest the bus. There is an hourly service from the main bus station in Nottingham called The Sherwood Arrow – see more info about that here. The nearest train station is Shirebrook which is 6 miles away and there’s also Mansfield Woodhouse which is 6 and half miles away and Mansfield which is 7 miles away. If you’re looking to stay nearby the hotel then there’s plenty of small independently owned guest houses, bed and breakfasts and hotels nearby in some of the small villages in the area. Of course, recommending something is dependent on what you want for your overnight stay, but one to look at is the Dukeries Lodge which is located in Edwinstowe itself. You can see more info about the hotel here. I always recommend the booking site Hotels Combined – it’s what I use and it will compare all the booking sites for the best deal so less work to do for you! For hotels near Sherwood Forest have a look here. If you’re looking for a self catering apartment or cottage (and I saw some lovely ones when I did a quick search!) then Airbnb or HomeAway are my preferred companies who I have used myself in the past. 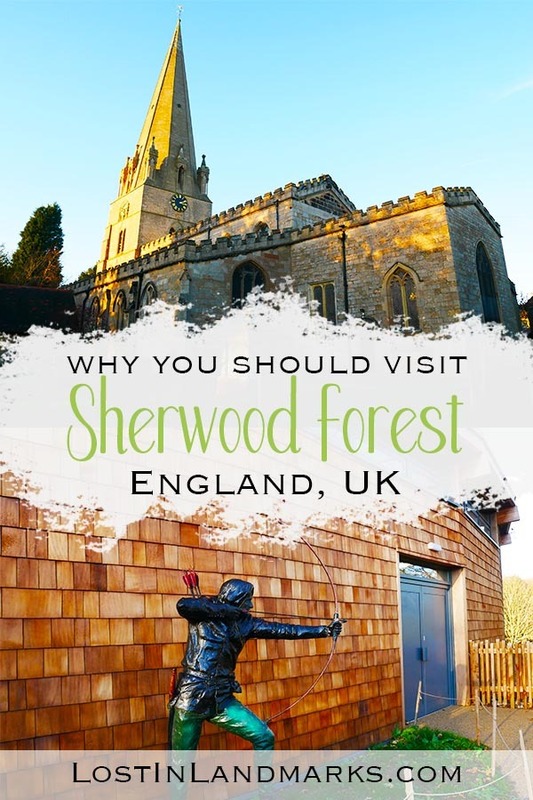 If you don’t have a car then Nottingham is a good city to base yourself in for a visit to Sherwood Forest because it has a host of other Robin Hood attractions in the city too. See above for details of the bus route to the forest and check out the hotels in the city here.